Last month, I published How I Structure My Day as a Consultant, giving you insight in my day-to-day flow. Today I'd like to share another one of our core business practices: The Weekly Plan. We all struggle with productivity and ever-growing tasks lists. Even worse, we are living in a world with an increasing number of interruptions and distractions. In a world where there is always more to be done, how can we stay motivated and focused on the most important tasks? We keep a master backlog of action items for each of our projects. When we note the need for a new task, it is added to the backlog. At the end of each week we review the backlog and select items to work on the following week. By separating the identification of tasks from their assignment, we prevent ourselves from getting distracted and help ourselves stick to the plan. We select five Most Important tasks for the following week. These tasks should be the focus of your week. If you ONLY accomplished these tasks, your week will be considered a success and you will know you made progress. We select five Secondary tasks for the week. These tasks are important, but have lower priority compared to the Most Important tasks. If there is a conflict in timing, Most Important wins. We then select 5-10 Bonus tasks. These tasks are opportunistic, but do not need to get done this week. They are typically used as filler tasks whenever there is a scheduling gap or block of free time. We also take the time to note down any interesting notes for the week. Are there meetings, calls, due dates, or other items we need to keep in mind? Is one of our clients out of office? Anything that requires a reminder for the week is noted down. These three task lists feed into our day-to-day planning process. Once our plan weekly plan is set, we try our best to avoid changing it. We select the tasks from the Weekly Plan. The Most Important Task receives our attention first, and we do not move on to other tasks until it is completed. The Secondary Tasks are accomplished afterward the Most Important Task is completed, and we will typically intersperse bonus tasks as timing allows. We keep a checklist of "pre-work activities" which we want to perform every day before beginning starting work. These help us stay on track with our habits, such as working out, reading, and journaling. For each task, we produce an estimate for the amount of time it will take us. We use the Pomodoro Technique for scheduling, but you can use whatever method you like. As we complete each task, we track the time it takes us and note it down. We log the total estimated time and actual time worked for each day. At the end of each day, we note down a subjective productivity score (1-10). We use this score to correlate perceived productivity with our accomplishments, pre-work activities, and any daily notes. This score helps us identify whether we are just feeling unproductive, or whether something caused us to become less productive that day. At the end of each workday, we generate a plan for the following day. This planning process includes selecting tasks to accomplish from the weekly plan and producing initial time estimates for each task. By starting each day with a plan, we can jump right into working on the most important task without distractions. If a Most Important Task was not finished, why? After the meeting, we generate the plan for the following week and the cycle continues. Since we have this meeting every Friday, I generate my plan for the following Monday using the new weekly plan. The original inspiration for our weekly planning process came from the Productivity Planner, produced by Intelligent Change. We have since outgrown the planner and have integrated the process into our Evernote workflow. If you prefer to use a paper planner, the Productivity Planner is for you. It's a high-quality, hard-back notebook which will help you stick to a weekly and daily planning process. 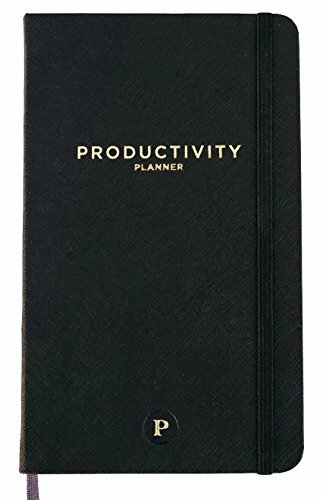 If you are interested in purchasing the Productivity Planner you can support Embedded Artistry by using our Amazon affiliate link. We also share our weekly plan template below. We no longer utilize the Productivity Planner. Instead, we have integrated our weekly planning and review process into our Evernote flow. On Friday, we create a new note for the following week. We identify the most important tasks, secondary tasks, and bonus tasks that we want to accomplish that week. At the end of each workday, I pull from the weekly task list and populate the plan for the next day. This helps me start every day with a plan, rather than deciding what I will be working on as the day starts. On Friday mornings we meet, review our progress and talk about what went well and what didn't go well. Are you going to send too much information or too little? Did you cover all of the necessary details? Is it clear what is expected of both parties? How can you prevent scope screep but still help the client with unexpected problems? We experienced these same struggles and frustrations in our practice. We also realized early on that we were generating our proposals inconsistently: some were contained in an email, others were given verbally, and a small number where presented as formal documents. Our favorite projects were the ones which clearly and concisely documented the client's objectives and requirements. We also discovered a successful method for handling out-of-scope requests without being exploited. We decided to standardize our approach and create a skeleton that we could re-use for each prospective client. We're now making that same proposal template available to you. Our template contains the structure that we use on each of our proposals, comments for how to fill out each section, and a selection of sample terms. You can even use this template as a lightweight contract - and we have done so many times. Armed with our template, you will find yourself consistently creating powerful and sleek proposals for your client. You can purchase Embedded Artistry's project proposal template below or from the Embedded Artistry store. This project proposal template is what Embedded Artistry uses for our consulting projects. Armed with our template, you will find yourself consistently creating powerful and sleek proposals for your clients. When I started consulting, getting contracts in place was one of the most intimidating activities. The contract situation changes from client to client: some expect me to provide the consulting agreement, others expect to use their own 8-page agreement prepared by their lawyers, and the rare prospect expected me to start working just because we reached conceptual agreement. If you have the funds, we advise that you find a legal partner who can help you create and review contracts. However, when I started my business, I was strapped for cash and scrounged together whatever agreements I could get my hands on. I stripped down some of the massive consulting agreements to create my consulting services agreement and also used my project proposal template as a lightweight contract. These agreements served me well until I was able to afford legal counsel. I recently joined the IEEE to take advantage of the insurance benefits, when I discovered excellent consulting resources provided by IEEE and Beazly, one of the insurance underwriters. Both documents serve as excellent starting points for creating your own consulting agreement. If you're working off of a client's legal template, there is also an amazingly helpful Contract Review Checklist. You should work through the checklist for all agreements that come your way. Don't get bullied into an unfair and one-way consulting arrangement! As always, Beazly, IEEE, and myself recommend getting your agreements reviewed by a lawyer as soon as possible. P.S. If you think this is a waste of time, take two minutes to read "Why is a written contract important?". Why is a written contract important?